"With 250 meters to go, Maarten van der Weijden was still at least 3 body lengths behind David Davies at the 2008 Beijing Olympics 10 km marathon swim along the final homestretch. I believe his tremendous finish represents the greatest upset and most moving and unlikely finish of all events throughout modern-day Olympic history," recalls Steven Munatones about the leukemia survivor. 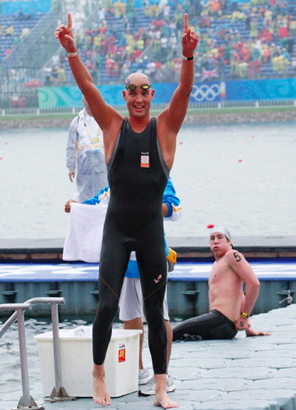 "Maarten is a champion like no other - both during his Olympic career and his post-Olympic career." 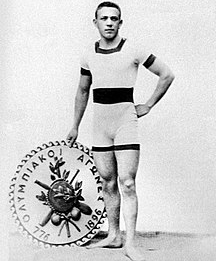 From Alfréd Hajós (gold, shown on left), Ioannis Andreou (silver) and Efstathios Chorafas (bronze) finished 1-2-3 at the 1896 Olympic Games in a cold 1.2 km bay swim in Athens, Greece. 112 years later in the warm ocean waters off Rio de Janeiro, Brazil, Ferry Weertman captured a gold medal on the very last stroke over Greece's Spyridon Gianniotis with Frenchman Marc-Antoine Olivier in third at the 2016 Rio Olympic Games. Munatones will present the history of open water swimming at the 1896, 1900, 1904, 2008, 2012 and 2016 Games and the future expected in 2020 Tokyo Olympics at the WOWSA Talks at The Olympic Club on November 10th. The presentation will be part of 25 different 20-minute WOWSA Talks by luminaries in the sport of marathon swimming, channel swimming, open water swimming, stage swimming and ice swimming. "We will also discuss - thinking creatively based on what we know now - how the 10 km marathon swim will play out in Tokyo in 2020, Paris in 2024 and Los Angeles in 2028," says Munatones. "Who to expect in the lead pack? Who might be in the chase pack? What types of workouts do the top athletes do? Because the evolution of the sport can be comprehensively traced back for decades, the expectations for the future can be imagined and predicted. He will talk about the contemporary technologies that are used, the most popular websites and personalities in the sport, controversies, and how elite open water swims are officiated, adjudicated and administered. ​To listen to the 25 speakers from 12 countries at the WOWSA Talks & WOWSA Awards, register here.